(TNS)—The big tax question of the year: Will you get a supersized refund or suddenly discover that you’re going to end up writing one monster check? If you think you’re getting the same tax refund as last year—or even bigger with the tax cuts—think again. It’s not that simple. Some are owing more money. A Novi, Mich., homeowner told me he was shocked when he was smacked with having to write a big check to pay his tax bill after he completed his 2018 tax return. He owes more than $3,000 when typically he received roughly a $4,000 refund in the past. The homeowner told me that he understood there was a $10,000 limit on how much one could deduct for property taxes on the federal return, after the major tax overhaul. What he didn’t know: The $10,000 cap includes much more than property taxes. The limit also impacts how much the couple can deduct when it came to what they paid for state income taxes. Many homeowners who itemize need to dig a little deeper into what’s known as the new SALT tax cap—the state and local tax deduction. The limit covers how much you can deduct when it comes to property taxes, state and local income taxes, and sales tax, even license plates on cars in some states, such as Michigan, says Leon LaBrecque, chief growth officer for Sequoia Financial Group in Troy, Mich.
Where people can run up against this limit: a larger property tax bill; a higher-income household; double-income W-2; multiple homes, like a cottage, LaBrecque says. For example, a Michigan couple making $150,000 in income would pay around $6,500 in Michigan state income taxes. A home with a value of $165,500 might involve property taxes of $2,500 or higher in Michigan. Then state license tabs on a couple of cars (listed on Schedule A for those who itemize as “personal property taxes”) could be $300 or $350. If the cars are newer and nicer, the cost of the license tabs is higher. LaBrecque says his license tabs cost $800. He has a 2016 Jeep Grand Cherokee, 2016 Ford F-150, a 2015 BMW 550 and a 2017 Ford Escape. We heard much about how some taxpayers would be hard hit by the cap in high-property tax states, such as New York, New Jersey and Connecticut, but residents elsewhere are getting hit too, for various reasons. “The vast majority of my clients are getting clipped due to the SALT ceiling,” says George W. Smith, a certified public accountant with his own firm in Southfield, Mich. The ones getting hit often have higher earnings and possibly a second home, such as a cottage or a vacation home, he says. One client has a vacation home on the Chesapeake Bay along the East Coast and will lose about $20,000 in state and local tax deductions. She is single and will pay about $4,800 in income taxes. “Some are benefiting from that regardless of the SALT cap,” Smith says. For many people, it’s a real surprise to see how their tax returns are playing out this year. Just because you’re getting a tax cut under the new rules doesn’t mean you’re going to see a tax refund in the spring. Many people already saw much of their tax break via their paychecks in 2018 when the tax withholding tables were changed and allowed workers to see an immediate break in take-home pay. Some got more money during 2018 than they should have under their tax situation, and they will have to pay that back once their taxes are prepared and filed by April 15. “That’s going to be a bad surprise for a whole lot of people,” says Christine Ishman, president of Northern Financial Advisors in Bloomfield Hills, Mich.
Ishman, an enrolled agent who prepares tax returns, says about 75 percent of her clients are paying more than they’d expected this tax season for a variety of reasons. Some lost key tax deductions. For example, the miscellaneous deduction was eliminated and one can no longer deduct job hunting expenses, moving expenses related to a new job, unreimbursed employee costs, tax preparation fees and the like. The costs of such items could have been deducted once expenses exceeded 2 percent of your adjusted gross income. Take the case of the Novi couple. Under the new tax rules, they will still itemize but they lost miscellaneous deductions, according to Ishman, who prepared their return. Like other tax filers, they also lost four exemptions for themselves and two children in college—which were $4,050 each on their 2017 returns. Each personal exemption reduced gross income by $4,050 on 2017 returns. The exemption phased out for higher earners. They also saw more take-home pay, she says, and will now be giving some of that money back. A variety of moving parts, of course, come into play when calculating your actual tax bill. Since the old tax rules no longer apply, your tax bill—and your tax refund—may not look anything close to what it did last year. Most households will see some tax cuts, thanks to a lower tax rates and a higher standard deduction, which is nearly double what was used for 2017 tax returns. Nearly 65 percent of tax filers will see a tax cut overall and pay less for their 2018 individual income taxes than in the past under the old rules. The average tax savings would be about $2,180 for that group, according to the nonpartisan Tax Policy Center in Washington, D.C. About 6 percent are expected to pay more. The average tax increase would be $2,760. Twenty-nine percent would see no change. Tackle your tax return as early as you can this year in order to claim any larger-than-expected refund. 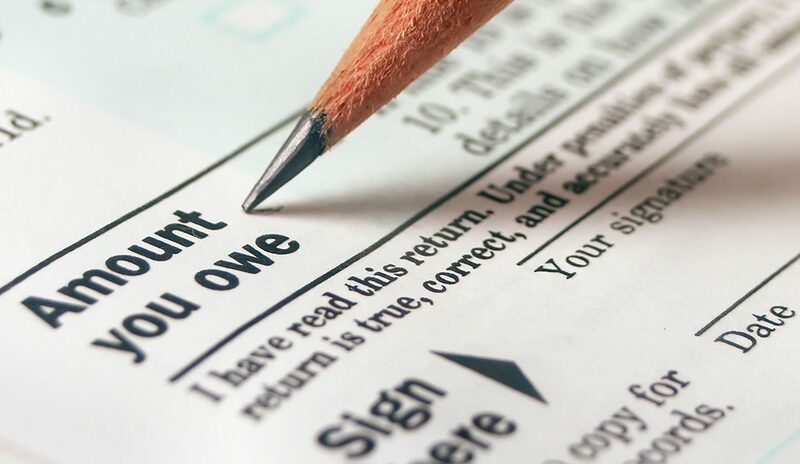 If you owe money, it’s better to know earlier in the game than at the last minute on April 15.